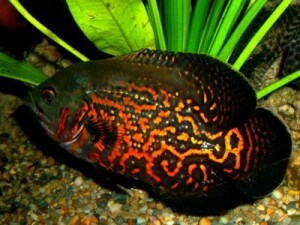 This is a big Cichlid, territorial and digger. Must be reared in a tank with plenty of space for swimming, hiding places, strong plants such as Anubias and Echinodorus along the sides of the aquarium (with the roots protected by large rocks or wood) and sand bottom end height of 10 centimeters. Usually they became 35 centimeters long for more than a kilogram in weight. When young, can be raised in a small herd of 4-5 individuals, but these should be separated as soon as there will be the formation of the final pair, with the consequent rise of territoriality. Can not be kept with smaller fish, and can be very aggressive when playing. It feeds well with different foods: food for large cichlids plant-based, sand smelts, mussels, shrimps, Bloodworms, earthworms and small live fish, occasionally even blanched vegetables such as spinach and carrots. Spawning takes place on a flat stone. They lay between 1000 and 2000 eggs each time, and the offspring is handled by both parents until it is big enough. The children need, after having absorbed the yolk sac, a diet of infusoria, because of their small size, and after a few more days you can switch to a diet based on newly hatched brine shrimp.